1 Instituto de Ciencias Biomédicas, Facultad de Medicina, Universidad de Chile, Independencia 1027, Santiago, Chile. 2 BiosChile, Avenida Marathon 1943, Santiago Chile. 3 Facultad Ciencias de la Salud, Universidad Diego Portales, Ejército 141, Santiago, Chile. 4 Millenium Nucleus in Developmental Biology, Departamento Biología, Facultad de Ciencias, Universidad de Chile, Casilla 653 Santiago, Chile. Protein kinase CK1 is a ser/thr protein kinase family which has been identified in the cytosol cell fraction, associated with membranes as well as in the nucleus. Several isoforms of this gene family have been described in various organisms: CK1α, CK1ß, CK1δ, CK1ε and CK1γ. Over the last decade, several members of this family have been involved in development processes related to wnt and sonic hedgehog signalling pathways. However, there is no detailed temporal information on the CK1 family in embryonic stages, even though orthologous genes have been described in several different vertebrate species. In this study, we describe for the first time the cloning and detailed expression pattern of five CK1 zebrafish genes. Sequence analysis revealed that zebrafish CK1 proteins are highly homologous to other vertebrate orthologues. Zebrafish CK1 genes are expressed throughout development in common and different territories. All the genes studied in development show maternal and zygotic expression with the exception of CK1ε. This last gene presents only a zygotic component of expression. In early stages of development CK1 genes are ubiquitously expressed with the exception of CK1ε. In later stages the five CK1 genes are expressed in the brain but not in the same way. This observation probably implicates the CK1 family genes in different and also in redundant functions. This is the first time that a detailed comparison of the expression of CK1 family genes is directly assessed in a vertebrate system throughout development. Key terms: CK1, Casein Kinase 1, Expression pattern, Development, Zebrafish, otic vesicles, retina, lens, pectoral fin bud, tegmentum, myelencephalon, telencephalon, diencephalon, mesencephalon, rhombomeres. Protein kinase CK1 is a ser/thr protein kinase which has been identified in the cytosol cell fraction, associated with membranes as well as in the nucleus. A cell-cycle-dependent localization to mitotic spindles of dividing cells has also been reported (Vielhaber and Virshup, 2001; Knippschild et al., 2005) Identification of cDNAs encoding vertebrate CK1 has revealed seven isoforms to date: CK1α (casein kinase 1, alpha 1), CK1ß (casein kinase 1, beta), CK1δ (casein kinase 1, delta), CK1ß (casein kinase 1, epsilon) and three CK1γ (casein kinase 1, gamma 1-3) isoforms (Gross and Anderson, 1998; Burzio et al., 2002). Members of the CK1 family have been recently involved in developmental processes, associated to the wnt signalling pathway (Liu et al., 2002; Marin et al. 2003) and the sonic hedgehog pathway (Pan et al., 2006; Tempe et al., 2006). For example, CK1γ was recently shown to induce secondary axes in Xenopus laevis, stimulating (ß-catenin signalling, thus functioning in a manner that is opposite to that demonstrated for CK1α (Liu et al., 2002; Cong et al., 2004). This last isoform is essential for (ß-catenin phosphorylation in a priming mechanism that also involves GSK-3 and which is required for (ß-catenin degradation (Liu et al., 2002). Zebrafish have emerged as a powerful model system to study development, due to their external development, transparency of embryos and the availability of mutants, transgenic lines and gene knock-down technology (Lewis and Eisen, 2003; Lee and Chien, 2004). To further the study of CK1 family genes in early zebrafish development we are reporting in this communication the cloning of four CK1 isoforms: CK1γ (csnk1e), two isoforms of CK1δ (called csnk1d-a and csnk1d-b) and one isoform of CK1γ-2 (csnk1g2). We also described their mRNA expression by RT-PCR and by in situ hybridization and included in our studies the expression patterning of the previously cloned zebrafish CK1α isoform (Burzio et al., 2002). The expression patterns of these genes for the first two days of the zebrafish embryonic life are presented. Zebrafish embryos were raised according to standard procedures (Westerfield, 1995) and staged in hours post-fertilization according to Kimmel et al. (1995). All embryos were collected by natural spawning, Kimmel et al. (1995) and were raised at 28°C in E3 medium (5 mM NaCl, 0.17 mM KC1, 0.33 mM CaCl2, 0.33 mM MgS04, and 0.1% methylene blue) in petri dishes (Haffter et al., 1996). Larval stages are expressed in hours postfertilization (hpf). CK1α (csnk1al) was previously cloned as described by Burzio et al., 2002. The other CK1 genes were cloned by RT-PCR (Sambrook et al., 1989) from public database ESTs. Briefly, a 24 hour postfertilization zebrafish embryo cDNA library was synthesized by reverse transcription using oligo-dT primer and RNAse H (Sambrook et al., 1989). The library was used to amplify the CK1 genes by PCR using specific primers derived from zebrafish ESTs. Primers for CK1γ isoform (csnk1e) were obtained from ESTs AW305656 and AW282083. For CK1γ-2a isoform (csnk1g2a), primers were derived from ESTs BM103034 and BM103881 and for the two sequences that coded for CK1δ isoforms, csnk1da and csnk1db, the primers were derived from ESTs BQ263495, AW174665, AW127719 and AW115550). Using this strategy we cloned a complete ORF of each of the zebrafish CK1 isoforms. ORFs were cloned in pCRIITopo (Invitrogen) or Bluescript (Stratagene). All the above clones were sequenced in both directions using an automated DNA Sequncer (CESAT facility, ICBM, Facultad de Medicina, Universidad de Chile) or manually (Sambrook et al., 1989). The CK1 cDNA cloned sequences were confirmed by independent PCR from three different cDNA libraries derived from mRNA obtained at 3, 10 and 24 hpf zebrafish embryos. In the Ensemble database (www.ensembl.org/Danio_rerio) seven predicted zebrafish genes were found: The gene identification number ENSDARG00000007993 maps to chomosome 14 and codes for CK1α isoform (Csnk1al); ENSDARG00000055907 maps to chromosome 12 and codes for CK1ε (Csnk1e); ENSDARG00000008370 maps to chromosome 3 and codes for CK1δa (Csnk1da); ENSDARG00000006125 maps to chromosome 12 and codes for CK1δb (Csnk1db); ENSDARG00000005458 maps to chromosome 2 and codes for CK1γ-2a (Csnk1g2a); ENSDARG00000034056 maps to chromosome 8 and codes for CK1γ-2b (Csnk1g2b); ENSDARG00000033872 maps to chromosome 7 and codes for CK1γ-1 (Csnk1gl). To evaluate the expression of CK1 genes in embryos, RT-PCR was performed, with primers as follows: for CK1α (amplified four fragments: CK1αLS: 748 pb; CK1αL: 712 pb; CK1αS: 664 pb; CK1α 628 bp) CK1αF1 5'- GCCGTCACTGTAATAA-3' and CK1αRj 5'-TGGTGAATTTGATCCT AG-3'; for CK1ε (amplified fragment 780 bp) CK1εF2 5'-GCTCTGCAACATCTCTG TCA-3' and CK1εR2 5'-TACTTTGATAT GTGTGTTTATTTA-3'; for CK1δa (amplified fragment 1003 bp) CK1δaF2 5'-GACCCTCCACACGCCTCA-3' and CK1δaR2 5'- ACAGCATGGACTCAA CCACG-3'; for CK1δb (amplified fragment 1001 bp) CK1δbF2 5'-ATGCTCCTCACA TTCTTGTGT-3' and CK1δbR2 5'-AAGAGTCAAAGTTCATGTTCAG-3'; for CK1γ-2a (amplified fragment 512 bp) CK1γ-2aF2 5'-ATGGATTTTGATAAGA GAGGAGG-3' and CK1γ-2aR2 5'-TTAACATCCCTGTAGATC-3';). mRNA was obtained using Trizol® Reagent according to the manufacturer's indications (Invitrogen, San Diego, CA, USA) from embryos at different stages of development (3, 4, 6, 9, 12, 24, 48, 72, 144 hpf). RT was performed with the cDNA Cycle Kit (Invitrogen, San Diego, CA, USA) according to the manufacturers' instructions. As internal control we used ß-actin primers: Fl-5'-GACATCAGGGAGT GATGGTTG-3' and Rr5'- CTGACCGTC AGGCAGCTCATA-3' (amplified fragment 622 bp), as described previously (Chen et al., 2002; Mackenzie et al., 2004). A neighbor-joining dendrogram was constructed, employing a Kimura 2-parameter distance matrix of Kimura (1980) as input. Phylogenetic trees were obtained through the neighbor-joining method (Saitou and Nei, 1987), employing the MEGA3.1 program (Kumar et al., 2004). Phylogenetic analysis was performed with 7 CK1 zebrafish gene family members and 28 other CK1 genes from different species (Accession numbers H.sapiens CK1 family genes: CK1α NM_001025105; CK1δ BC003558; BC015775; CK1γ NM_152221; CK1γ-1 NM_001011664; CK1γ-2 BC018693; CK1γ-3 AF049090. M.musculus: CK1α AK146873; CK1δ NM_027874; NM_139059; CK1γ BC026127; CK1γ-1 NM_173185; CK1γ-2 AK132871; CK1γ-3 BC033601. X.laevis: CK1α Y08817; CK1δ AY926535; CK1γ AF183394; CK1γ-1 BC070639; CK1γ-2 BC073708; CK1γ-3 BC090234. X.tropicalis: CK1α BC067926; CK1δ BC062487; CK1γ NM_001011137; CK1γ-1 CT030290; CK1γ-2 BC089657; CK1γ-3 BC090234. G.gallus: CK1α NM_205053; CK1δ XM_415634; CK1γ NM_204377; CK1γ-1 NM_001005800. The accesión numbers of D.rerio cloned genes are: CK1γ bankitl01372 EU127824; CK1Sa bankitl013757 EU127826; CK1Sb bankitl013739 EU127825 and CK1γ-2a bankitlO 13782 EU127827. Deduced amino acid sequences were aligned using Clustal method (Chenna et al., 2003). Embryos were raised at 28 °C and fixed for in situ hybridization in 4% paraformaldehyde. Hybridizations were performed as previously described (Jowett and Lettice, 1994). Probes were designed to contain only the 3' UTR by using RT-PCR with the exception of the probe for CK1γ-2a that contain part of the 5'UTR and part of the coding region (see above). The probes contained 816 pb, 780 pb, 1003 pb, 1001 pb and 1036 pb for CK1α, CK1ε, CK1δa, CK1δb and CK1γ-2a, respectively (oligos for CK1α PCR: CK1αF2 5'-GCATTAAGA CAATGTAATGAAGC-3' and CK1αR2 5'-AGACTTCAGAATACCAAGTAC-3'; for CK1ε: CK1εF2 5'-GCTCTGCAACAT CTCTGTCA-3' and CK1εR2 5'- TACTTTGATATGTGTGTTTATTTA-3'; for CKIδa: CK1δaF2 5'- GACCCTCCACACG CCTCA-3' and CK1δaR2 5'-ACAGCA TGGACTCAACCACG- 3'; for CKISb: CK1δbF2 5'-ATGCTCCTCACATTCTT GTGT-3' and CK1δbR2 5'- AAGAGTC AAAGTTCATGTTCAG-3'; for CK1γ-2a: CK1γ-2aF3 5'- TGAGCATTAAAATCG ACCAAA-3' and CK1γ-2aR2 5'- TTAACA TCCCTGTAGATC-3';). Embryos were mounted in glycerol and photographs were taken with a Leica DC300F digital camera on a Leica MZ12.5 stereomicroscope or on a Nikon Eclipse 80i microscope. After in situ procedures, the embryos were post-fixed 20 minutes in 1.25% glutaraldehyde/ 2% paraformaldehyde in BT buffer (0.15 mM CaCl2, 4% sucrose, 0.1 M phosphate buffer (Westerfield, 1995), as described previously (Bever and Fekete, 2002). Embryos were then dehydrated in graded ethanol series, and embedded in Paraplast plus® (UK), followed by sectioning at 9 µm and mounted in 3-aminopropyltriethoxysilane (Polysciences, Inc., Washington, PA, USA) treated slides and stained with eosin. To clone zebrafish CK1 isoforms we searched the zebrafish EST published libraries using as a virtual probe a zebrafish CK1α (csnk1a) cDNA derived from the coding region (Burzio et al., 2002; accession number NM_152951). To obtain the CK1 isoforms we used EST clones containing either full length or partial CK1 homologs, as well as PCR techniques where necessary. We found four cDNA sequences from four different CK1 family genes which we identified by their homology with mammalian CK1 orthologues. Two of the four cloned sequences were closely related to human CK1ε (csnk1e) isoform (ESTs AW305656 and AW282083) (A.N) and CK1γ-2 (csnk1 g2a) isoform (ESTs BM103034 and BM103881) (A.N). The other two sequences were closely related to human CK1δ (csnk1d) isoforms (ESTs BQ263495, AW174665, AW127719 and AW115550) (A.N). These genes probably arose by a genome duplication in teleost fish (Amores et al., 2004; Chen et al., 2004) and were designated casein kinase 1, delta a (csnkda) and casein kinase 1, delta b (csnkdb), in accordance with the zebrafish nomenclature for duplication genes (http://zfin.org/zfinfo/nomen.html). A neighbor-joining dendrogram was constructed, employing a Kimura-2 distance parameter matrix as input (Kimura, 1980). 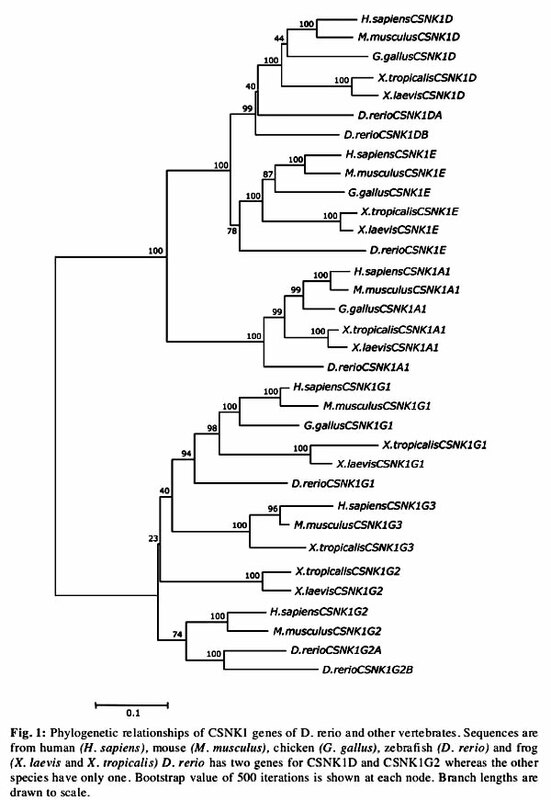 Phylogenetic trees were obtained with known CK1 cDNAs (Fig. 1) from different vertebrate species, through this neighbor-joining method (Saitou and Nei, 1987), employing the MEGA3.1 program (Kumar et al., 2004). Each one of the CK1 isoform families constitutes an exclusive branch with exception of CSNK1G2 in which X.tropicalis and X.laevis CK1 orthologues stay out of the clade. All the zebrafish CK1 genes segregated with their respective species homologues, as expected from pairwise comparisons. We also analyzed the zebrafish genome in the Ensembl database (http://www.ensembl.org/index.html) finding two more genes: one CK1γ-1 (csnk1gl) and a second gene for CK1γ-2 (csnk1g2). A CK1γ-3 was not found in the zebrafish genome. A graphical alignment (Fig. 2) of amino acid sequences of zebrafish CK1s and human CK1α (CSNK1A) shows the overall high degree of homology for CK1 family gene within and outside the serine/threonine protein kinase catalytic domain (Hanks and Hunter, 1995). 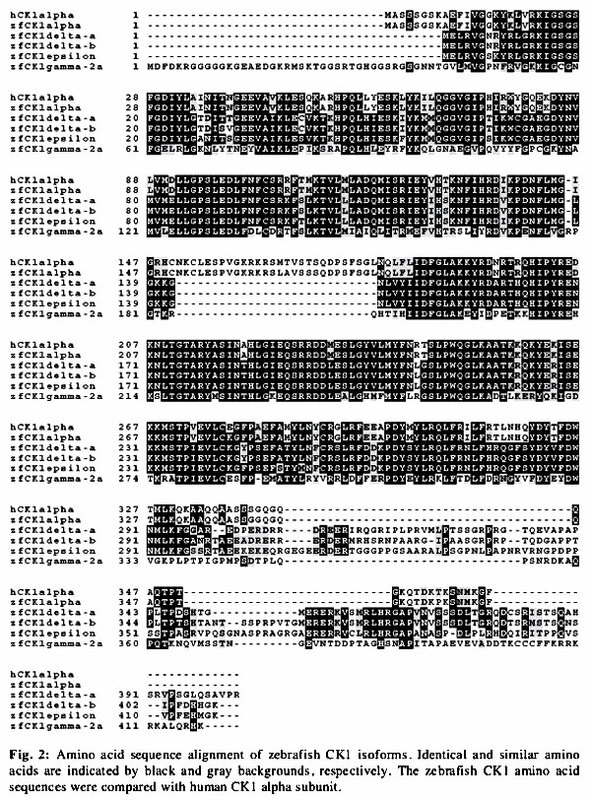 Zebrafish cDNAs coded for proteins of 365-418 amino acids in length (Fig. 2) and BLAST analysis of the deduced sequence indicated highest similarities with specific human CK1 (98% for Csnk1db, 93% for Csnk1 g2a, 91% for Csnk1 da and 87% for Csnk1e). This homology is markedly higher than that of other zebrafish genes cloned and probably is a consequence of a very conserved function of these family genes throughout evolution (Schweeitzer et al.,2005). We studied the zebrafish CK1 cloned genes at mRNA level by semi-quantitative PCR using zebrafish ß-actin expression as control (Fig. 3). We used specific primers for each gene. Alternative splicing of two exons (called L and S) has been described for CK1α (Csnk1a) in mammals, producing four different CK1α spliced variants (CK1α, CK1αS, CK1αL, CK1αLS) (Burzio et al., 2002). In zebrafish, RT-PCR detected the same spliced variants for CK1α mRNA previously described in mammals (Zhang et al., 1996; Green and Bennet, 1998; Yong et al., 2000; Burzio et al., 2002). However the expression levels of these spliced variants are significantly different. Both CK1α and CK1αS, the shortest spliced isoforms, have a maternal and zygotic expression component. CK1α is expressed during the whole embryonic and larval development (Fig. 3). CK1αS is progressively induced during embryonic development. Low levels of this mRNA are detected in the early stages of zebrafish development (Fig. 3: compare 3 hpf with 12 hpf). On the contrary, CK1αL expression decreases with the progress of embryo development (Fig. 3: compare 3 hpf with 72 hpf). Finally, CK1αLS expression is slight during zebrafish development. A weak increment in the expression level of this spliced variant could be detected between 9 and 24 hpf (Fig. 3). The other members of the CK1 family gene do not show alternative splicing at least in the embryonic and larval development stages. CK1ε (Csnk1e) is the only gene whose expression does not show a maternal component. Its expression is induced after 12 hpf. (Fig. 3). The other CK1 isoforms are expressed in all the stages analyzed. We identified two isoforms of human CK1δ (Csnk1da and Csnk1db). Both genes have maternal and zygotic expression and probably arose by genomic duplication in teleost fish (Chen et al., 2004). Finally CK1γ-2a (Csnk1g2a) is expressed in all the stages analyzed in our study. We will now describe the expression patterns of the five different CK1 mRNAs detected by in situ hybridization during the first 48 hours of zebrafish embryo development. We studied the gene expression pattern of the CK1α (Csnk1a) gene. Because we designed a probe of the 3'UTR region of this gene, in addition we simultaneously detected the four CK1α species generated by alternative splicing. mRNA in situ hybridization revealed a ubiquitous expression in early stages of development (Fig. 4: A-E). At 17 hpf and 24 hpf the CK1α transcript is detected in brain structures and somites (Fig. 4 D and E). After 24 hpf the expression becomes restricted to encephalic structures and at 30 hpf (data not shown) a weak signal is detected in the pectoral fin bud. The CK1α mRNA expression in the pectoral fin bud is clearly observed at 42 hpf and thereafter (Fig. 4 F, N, O and R). At 48 hpf the transcript was detected in forebrain, midbrain, retina, lens and also in the primordial pharyngeal arches (mandibular and hyoid archs) (Fig. 4 N and O). Because at 24 hpf the CK1α transcript is detected in the whole embryo, paraffin cross-sections and longitudinal sections of embryos were made. It was very surprising that the CK1α expression is not uniformly detected through the cross-sections of the embryos (Fig. 4 G, H, I). CK1α expression was detected in the lens and the retina of the embryo eye (Fig. 4 G and H). A more careful analysis of the cross- and longitudinal sections shows that the CK1α transcript is more highly expressed toward the periphery than in the medial region of the sectioned embryo tissue (see arrow heads in Fig. 4 G, H and I). In the caudal region of the brain the CK1α transcript is strongly expressed toward the ventral lateral side of the neural tube (Fig. 4 J, K, L and M). It is also possible to detect a very thin layer of CK1α expression in the medial region of the neural tube (see arrow head in Fig. 4 J, K. L and M). This gene is also expressed in the region surrounding the otic vesicle (Fig. 4 J). To confirm the CK1α gene expression pattern previously observed at 48 hpf, paraffin cross-sections were made. Like the expression observed in cross-sections of embryos at 24 hpf, the CK1α transcript is not uniformly expressed troughout the embryo brain. This gene is strongly expressed in the lens and the otic vesicle (Fig. 4 P and Q) and slightly in retina, mesencephalon, diencephalon and myelencephalon (Fig. 4 P and Q). 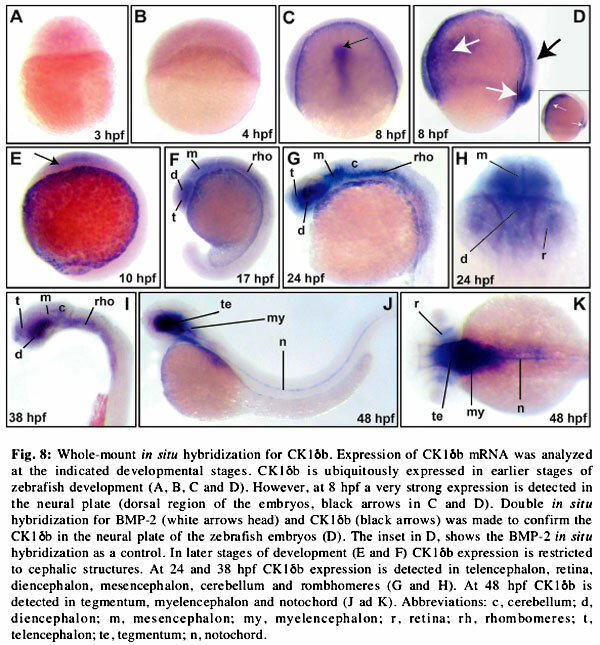 The CK1α expression detected in the pectoral fin by whole mount in situ hybridization was confirmed by cross-section of the embryos. In this case the expression was restricted to the basal mesenchymal component of the pectoral fin bud (Fig. 4 R). We conclude that the expression pattern of CK1α mRNA is ubiquitously expressed in early stages of the development. After 24 hpf the expression is limited to the cephalic structures and pectoral fin bud. Cross and longitudinal embryo sections made at 24 and 48 hpf indicate that CK1α expression is not uniform and it seems that it is concentrated at some cell clusters in the brain and the neural tube (Fig. 4 H and L). The CK1γ expression pattern is different from that observed with CK1α. CK1ε is not detected before 12 hpf and its expression is restricted to the brain (data not shown and Fig. 5A). At 24 hpf CK1ε expression is detected in the diencephalon, telencephalon, eye, tectum, mesencephalon, cerebellum, rhomboencephalon and otic vesicles (Fig. 5 B). At 30 hpf CK1ε expression is detected in the tegmentum and the otic vesicles of the zebrafish embryo (Fig. 5 F). At 48 hpf the CK1ε is restricted to the eyes (retina and lens), tegmentum, myelencephalon and otic vesicles (Fig. 5 G and I). A very feeble expression of this gene is detected in the notochord (Fig. 5 G inset). 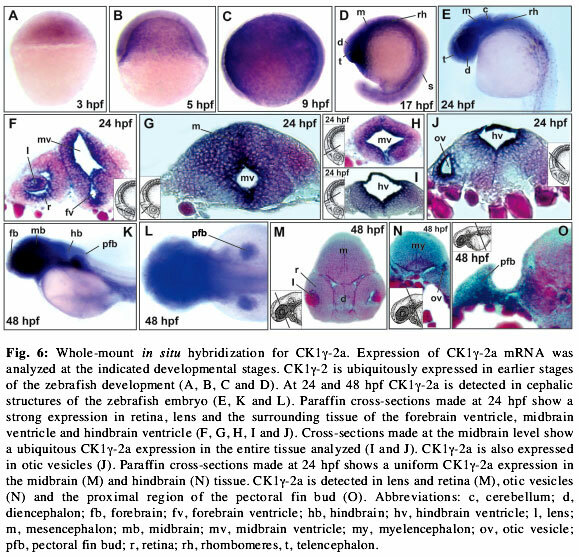 To obtain a more detailed information on zebrafish CK1ε expression, cross- and longitudinal sections were made at 24 and 48 hpf and the CK1ε expression studied. At 24 hpf the expression is detected in cerebellum, diencephalon, telecephalon and retina (Fig. 5 C). A remarkably strong CK1ε expression surrounds the hindbrain and the midbrain ventricles (Fig. 5 C and D). The otic vesicle CK1ε expression was confirmed by crosssection (Fig. 5 E). Like the CK1ε mRNA levels detected around ventricles in the brain, a robust expression is detected surrounding the otic vesicles (Fig. 5 E). At 48 hpf cross section experiments display strong expression in the tegmentum, retina in the eye, myelencephalon and otic vesicle (Fig. 5 H, J and K). 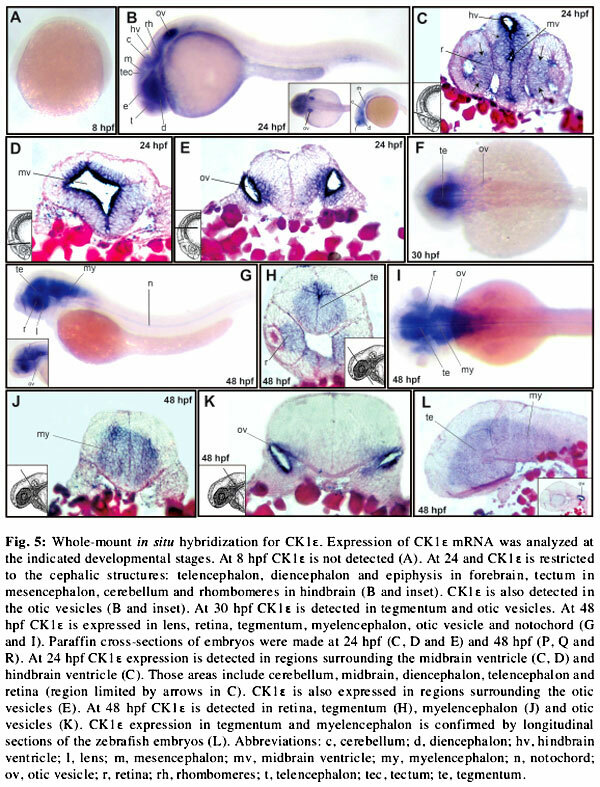 CK1ε expression in tegmentum and myelencephalon is confirmed by longitudinal section of the zebrafish embryos (Fig. 5 L). We conclude that CK1ε mRNA expression does not have a maternal component and it is restricted to cephalic structures during zebrafish development. The CK1γ-2a expression is very similar to the one observed with CK1α. This gene is maternally expressed and also shows a ubiquitous expression in early stages of the zebrafish development (Fig. 6 A, B. C). At 17 hpf the CK1γ-2a mRNA is detected in telencephalon, diencephalon, mesencephalon, rhombomeres and somites (Fig. 6 D). At 24 hpf CK1γ-2a is restricted to cephalic structures being detected in telencephalon, diencephalon, cerebellum and rhombomeres (Fig. 6 E). Cross-sections of zebrafish embryos at 24 hpf were made (Fig. 6 F, G, H, I and J). A robust expression of this gene is detected in lens and retina and also in the regions of the diencephalon and midbrain that surround the fore- and midbrain ventricles (Fig. 6 F, G and H). 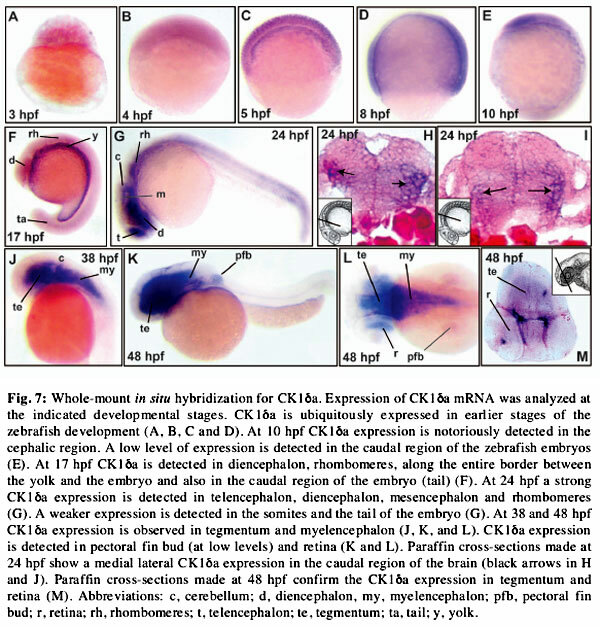 Towards the posterior region of the zebrafish embryo, the CK1γ-2 expression seems more uniform. It is strongly observed around the hindbrain ventricle and the otic vesicle (Fig. 6 I and J). At 48 hpf the CK1γ-2a mRNA expression is detected in the forebrain, eye, midbrain, hindbrain and pectoral fin bud (Fig. 6 K and L). Cross-section experiments of embryos fixed and stained at 48 hpf indicate that CK1γ- 2a is uniformly expressed through the mesencephalon and diencephalon, also detecting expression in the lens and the retina (Fig. 6 M). In the posterior area of the brain it is also possible to observe a regular expression of CK1γ-2a throughout the myelencephalon (Fig. 6 M). CK1γ-2a is strongly expressed in the otic vesicle and the pectoral fin bud (Fig. 6 N and O). In the pectoral fin bud, CK1γ-2a mRNA is localized in the proximal mesenchymal tissue. It is not expressed in the borders or in the distal region of the bud (Fig. 6 O). We conclude that CK1γ-2a is ubiquitously expressed in early zebrafish development. After 17 hpf the expression of this gene is restricted to the cephalic structures. Cross-section experiments indicate that CK1γ-2a is uniformly expressed in the brain tissue. Both genes CK1δa and CK1δb have a maternal and zygotic component in their expression (Fig. 7 A, 8 A and data not shown). Both genes are also ubiquitously expressed in zebrafish embryos until 8 hpf (Figs. 7 A, B, C, D and 8 A, B, C, D). However CK1δb displays a very significant difference with respect to CK1δa expression at 8 hpf. In this stage CK1δb shows a very robust expression in the neural plate (compare Fig. 7 D with 8 C). To verify that part of the CK1δb expression is related to the neural plate we made double in situ hybridization with CK1δb and BMP-2 probes. BMP-2 is expressed in the dorsal part of the zebrafish embryo (Fig. 8 D see white and black arrows). In this case it is possible to detect CK1ób expression (Fig. 8 D, black arrow) over the BMP-2 expression (Fig. 8 D, white arrow). Between 10 and 24 hpf CK1δa is expressed in the whole embryo, but this expression is stronger in the cephalic than in the posterior structures (Fig. 7 E, F and G). At 17 and 24 hpf it is possible to detect CK1δb expression in telencephalon, diencephalon, mesencephalon, cerebellum and rhombomeres. Also CK1δb expression is detected in the tail of the embryos (Fig. 7 F and G). However in the same stages the CK1δb mRNA expression is detected in cephalic structures: diencephalon. telencephalon, mesencephalon, cerebellum and rhombomeres (Fig. 8 F, G and H). At 38 and 48 hpf CK1δa is expressed in retina, tegmentum and myelencephalon (Fig. 7 I, J and K). A very weak expression is also detected in the pectoral fin bud (Fig. 7 L). At 38 hpf CK1δb is expressed in telencephalon. diencephalon, mesencephalon cerebellum and rhombomeres. This last result implicates that at 38 hpf stage CK1δa shows a different expression pattern than CK1δb (compare Figs. 7 I with 8 J). At 48 hpf CK1δb is expressed in retina, tegmentum. myelencephalon and notochord (Fig. 8 J and K). We did not detect CK1ób expression in pectoral fin bud (Fig. 8 K). At 24 hpf cross-section experiments were made to analyze CK1δa expression in the posterior region of the zebrafish brain. In this case the CK1δa expression is detected in the lateral region of the hindbrain (Fig. 7 H and I, see black arrows). At 48 hpf cross-section experiments made in the anterior region of the brain indicate that CK1δa is expressed in retina and tegmentum (Fig. 7 M). This last result confirms the CK1δa expression pattern observed in whole mount in situ hybridization at 48 hpf. We conclude that both CK1δisoforms are expressed in zebrafish embryos but they do not have the same expression pattern. Both genes have maternal and zygotic components of expression and are ubiquitously expressed in early stages. However at 8 hpf CK1δb shows expression in the neural plate. At this stage CK1δa is uniformly expressed. Until 24 hpf CK1δa is expressed in the whole zebrafish embryo while CK1ób is restricted to the brain. In earlier stages both genes have a relatively similar expression. We have cloned five members of the CK1 gene family of the zebrafish and also studied their mRNA expression pattern by semi-quantitative RT-PCR and in situ hybridization during development. This is the first time that a detailed comparison of the expression of CK1 isoforms is directly assessed in a vertebrate system throughout development. We identified in the zebrafish genome one copy for CK1 α isoform, one copy for CK1ε, two gene copies for CK1δ isoforms, one copy for CK1γ-1 isoform and two gene copies for CK1γ-2 isoforms. 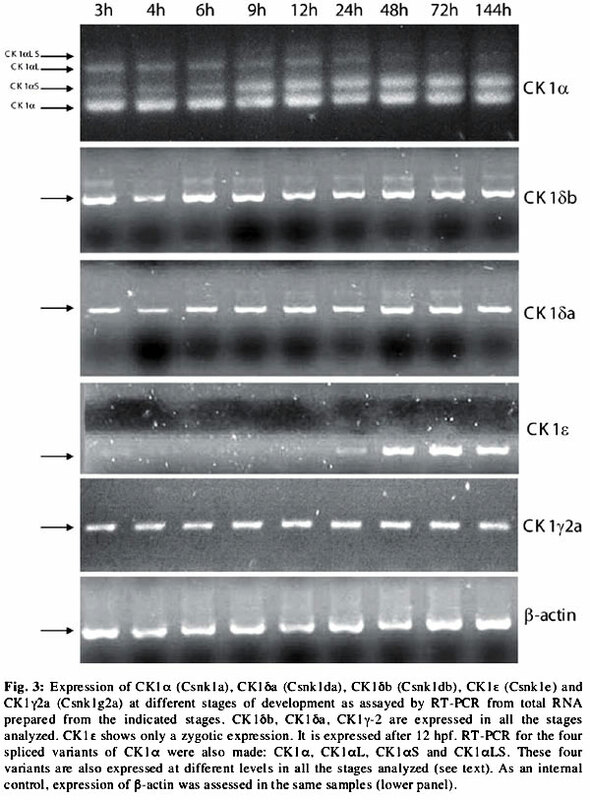 From these seven genes we cloned CK1 α, CK1ε, two cDNAs for CK1δ and one of the two copies for CK1γ-2. In zebrafish the existence of two gene copies for one kind of protein is not uncommon. This duplication is probably the direct result of the genomic duplication in teleost fish (Amores et al., 2004). The existence of seven genes coding for members of the CK1 gene family probably indicates a multiplicity of function for those genes during zebrafish development. It is probable that those isoforms carry out redundant functions during development. Of the five CK1 isoforms cloned, only CK1γ does not have maternal expression. The rest have maternal and zygotic expression. CK1α, CK1δa, CK1δb and CK1γ-2a are ubiquitously expressed in early stages of the zebrafish development. The differential expression pattern of CK1δa and CK1δb detected in the neural plate is remarkable. 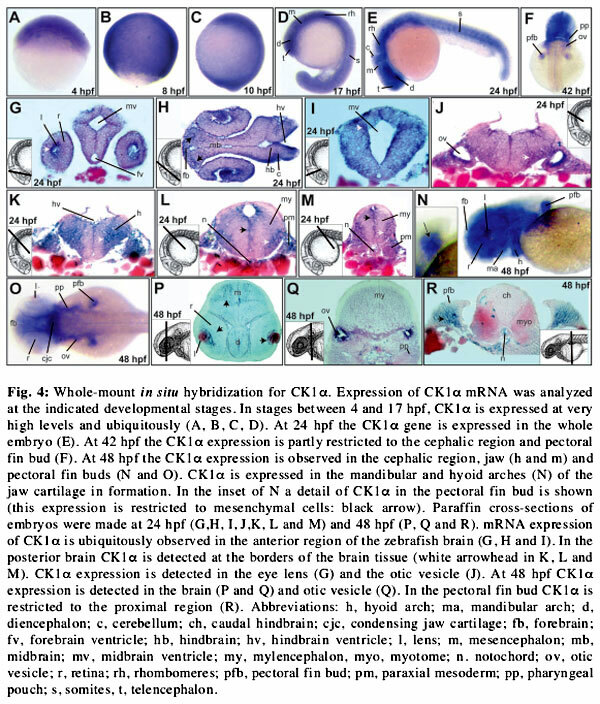 In later stages of zebrafish development both CK1δ genes and CK1ε have a similar expression pattern in the brain. One common point in the mRNA expression of the CK1 gene family is their expression in the brain in later stages of development. Although the CK1 gene family is expressed in some common locations in the embryos, they do not exhibit the same expression pattern. Actually, our results indicate that the CK1 genes are differentially expressed during development. Although orthologous genes have been described in several different vertebrate species (Tapia et al., 1994; Zhang et al., 1996; Green and Bennet, 1998; Yong et al., 2000; Burzio et al., 2002), there are no comparative expression studies made during vertebrate development at the mRNA level. Several studies seeking to detect CK1 isoform protein in cell culture and adult tissues of different species have been carried out (Camacho et al., 2001; Kannanayakal, 2006). In Xenopus the CK1γ-1 and CK1γ- 2 mRNA expression pattern studies during development have been done (Davidson et al., 2005). In comparison to zebrafish CK1γ-2a, mRNA expression for both genes described in Xenopus shows a similar expression throughout development. This last observation probably indicates a similar function for CK1 orthologues in the development of vertebrates. We thank Dr. Catherine Connelly for discussion and critical reading of the manuscript. This work was supported by grants from Millennium Scientific Initiative (ICM P02-050), Fondecyt # 1040697 to MA and Fondecyt # 1060441 to AER.